In 2004, ECLAC published a volume titled Política Social y Reformas Estructurales: Cuba a Principios del Siglo XXI that focuses on social policies during the period 1997–2002 (CEPAL 2004b). A collaborative effort among ECLAC’s Regional Office in Mexico, Cuba’s National Economic Research Institute (Instituto Nacional de Investigaciones Económicas, INIE), and the United Nations Development Program (UNDP), the volume technically speaking is not an official ECLAC document, as the authors of individual chapters are identified by name and the book carries a general caveat indicating that the opinions expressed are those of the authors. Nevertheless, the publication of the book by ECLAC and the UNDP is tantamount to endorsement of its findings and conclusions by these two prestigious international organizations. The book consists of an introduction and eleven chapters: (1) economic overview, structural reforms, and recommendations; (2) global overview of social policies and development; (3) education; (4) food consumption; (5) public health; (6) employment; (7) social security and social assistance; (8) housing; (9) water and sewage; (10) the historic core of the city of La Habana; and (11) conclusions and perspectives. An extensive statistical annex is available only on the Internet. This article assesses the volume in the light of analyses and statistics from Cuba, other work by ECLAC, international organizations and individual analysts, and our recent work. First we present overarching criticisms of the volume, and then evaluate each of the chapters dealing with social policies and the body of recommendations advanced in the book2 Quotations herein are our translations from Spanish. Citations to the book only provide the page number, while citations to the Statistical Annex only indicate table number. Other criticisms of the book, discussed in more detail below, include: (1) paints a picture of successful integral development in Cuba (i.e., balanced economic and social development) that is unsupported by the evidence and nevertheless is offered as a model for Latin America; (2) emphasizes positive developments, omitting or minimizing discussion of areas where there has been stagnation or even retrogression; (3) tends to attribute persistent socioeconomic problems to exogenous factors, while ignoring altogether or minimizing the role of wrongheaded economic and social policies; (4) fails to consider the continuing inefficient allocation of resources to wellperforming areas to the detriment of poorly-performing ones where resource needs are greatest; (5) lacks a long-term perspective, as it focuses on the period 1997–2002; while the earlier ECLAC book compared the 1990s with the 1980s, the new volume, by focusing only on the period 1997–2002, gives the erroneous impression that there have been significant socioeconomic gains, failing to note that in many cases the situation has not returned to the level of the 1980s, furthermore, the book does not address the sharp deterioration in socioeconomic indicators over the period 1991–94, nor does it compare levels in 2002 with the corresponding levels in 1989; (6) accepts official statistical data of questionable reliability without critical scrutiny customary in ECLAC publications dealing with other Latin American countries, and ignores serious problems associated with Cuban socioeconomic statistics, such as lack of information regarding the methodology for certain estimates and changes in statistical series leading to significant unexplained results; (7) incurs in contradictions between the statistics cited in the chapters and in the Statistical Annex and in other ECLAC publications; and information contained in the Statistical Annex is not always cited in the text; (8) does not address socioeconomic problems and shortcomings that have been raised in the literature cited by the chapter authors or by other Cuban analysts whose works are excluded in the bibliography; (9) makes comparisons with Latin America that are at best selective and in some instances technically incorrect; and (10) fails to provide a coherent, long-term social policy strategy, intimating that continuation of the policies implemented to date with some minor adjustments is sufficient to address the island’s outstanding socioeconomic problems. Chapter 2, authored by Ferriol, describes Cuba’s social policies and socioeconomic performance in the 1990s, when the economic crisis “highlighted some of the weaknesses of the social model,” and since 2000, when the equity promoted by the model was threatened by monetary duality and segmentation of consumer markets. Among others, two aspects analyzed by Ferriol in this chapter are poverty and inequality. Ferriol defines “population at risk” of poverty as the segment of the overall Cuban population with insufficient income to acquire a basic basket of food and non-food products, tantamount to the conventional concept of poverty incidence (p. 78). The original method for calculating the population at risk of poverty included two values not sufficiently clarified by Ferriol: (1) the cost of the basket of basic commodities is adjusted to take into account the subsidized prices associated with the rationing system; and (2) income is also adjusted to take into account free social services received by the population (Informe de Cuba 1997). According to Ferriol, the Cuban urban population at risk of poverty doubled between 1988 and 1996, from 6.3% to 14.7%, rose to 20% in 1999, and remained at that level through 2001. She attributes the sharp rise in the population at risk of poverty in the city of La Habana (from 4.3% in 1989 to 20.1% in 1995) to the widening of income inequality, but she later asserts that the population at risk of poverty in the city of La Habana fell to 11.5% in 1996 (pp. 79–81), raising questions about such a sharp change (almost 9 percentage points) over a single year period, particularly at a time of growing income inequality. In a chart, Ferriol compares Cuba’s population at risk of poverty with standard poverty incidence measures in four Latin American countries in 2001–02; the Cuban percentage is slightly higher than Uruguay’s in terms of lowest “urban poverty,” but much lower than those for Panama, Colombia, and Ecuador (p. 81). But this comparison is not appropriate because the measure of population at risk of poverty used in Cuba reduces the size of poverty incidence used in Latin America and elsewhere. Moreover, Ferriol excluded from the comparison Costa Rica (with a poverty incidence lower than Cuba’s population at risk of poverty) and Chile (percentages were comparable), but chose to include Colombia and Ecuador, with very high poverty incidence (CEPAL 2001). Explaining that her estimates excluded price subsidies and free social services, a Cuban economist calculated the “severity of poverty index” developed by Amartya Sen for the Cuban population at large (not just the urban population); for 1995 she calculated the severity of poverty index at 39.7% or 41.8% (based on two different variables) and the incidence of poverty at 61% to 67% (Togores 1999). Ferriol ignores these estimates as well as the results of a survey of individuals’ perception of poverty carried out by INIE in the city of La Habana in 2002 (although the results of this survey are analyzed in an article she wrote and cites in the bibliography). The survey asked subjects to place themselves in one of three categories: poor, nearly poor, and not poor. Thirty-one percent of respondents considered themselves as poor and 23% nearly poor in terms of income, and 23% and 20%, respectively, with respect to general living conditions (Ferriol 2003). These two sets of estimates indicate a higher level of poverty than calculated by the population at risk of poverty methodology. Ferriol notes that in 1986–89, at the time of the socalled Rectification Process, “there was a tendency toward the homogeneization of society” because of (1) higher “egalitarianism in consumption” accomplished by higher subsidies to consumers and expansion of the range of free goods and services made available to the population; and (2) the narrowing of wage differentials. The incentive to earn a salary as an inducement to work declined, and absenteeism and underemployment rose (pp. 67–71). The modest economic reforms of the 1990s reestablished wage incentives to work, but broadened wage differentials and created a segmented consumer market, increasing inequality. According to Ferriol, “the commodity rationing system … that benefits all Cuban families … covers at least 50% of the nutritional needs of the population at subsidized prices” (pp. 72, 78). But it is well known that the monthly rations cover only about one week’s food needs and consumers must turn to agricultural markets, hard-currency stores (tiendas de recaudación de divisas, TRD), or the black market to purchase food to meet their needs. Prices in these markets are substantially higher than rationed prices or purchases can only be made with foreign currency. Ferriol cites a study of the city of La Habana in 2001 that indicated that households made 85% of food purchases in these markets; even the lowest-income consumers spent a significant share of their food budget (56% for the lowest income decile, 66% for the second decile) in purchases outside of the rationing system (pp. 149, 150).4 She adds that the degree of “dollarization of consumption” is excessive (62% of households had access to dollars, principally from foreign remittances) and generates inequalities between those with and without access to dollars (pp. 66, 73). However, the state continues to offer free social services to the entire population, which tends to reduce inequalities, although the quality and some times the availability of such services has deteriorated, as will be discussed below. There has also been a significant increase in income disparity. A chart (p. 204) suggests that the average monthly real salary of civilian workers in the state sector rose by 17.4% between 1998 and 2002. However, ECLAC had earlier estimated a fall of 45.2% in the real salary of these workers in 1989–98 (CEPAL 2000a) and two Cuban economists calculated a real salary reduction of 31.5% between 1989 and 2002 (Togores and García 2003; Togores 2004). Meanwhile, private sector income rose appreciably and the differential access to remittances increased the income gap. While in 1989, the ratio of higher to lower salary for civilian state employees was 4.5:1, in 1995 the ratio of highest to lowest decile in average household income in the city of La Habana was 150:1, and in 2001 it was 199:1 (Quintana et al. 1995; Espina 2003). Before the economic crisis, physicians, engineers, university professors, and other professionals were at the top of the salary scale, together with government ministers. At present, the highest income earners are owners of paladares, musicians, artists, landlords who rent rooms in their homes to foreigners, and small farmers. We have estimated that the ratio of highest to lowest income in the city of La Habana in 2002 was 12,500:1 (Mesa- Lago and Pérez-López 2005). Although all evidence suggests that inequality in income distribution has grown, Cuba has never published income distribution statistics. Ferriol states that “the most recent estimate of monetary income inequality, measured by the Gini coefficient, was 0.38 for the urban area in 1996–98” (p. 83). The author does not indicate whether the income measure refers only to income generated from interactions with the state, or also includes income from private sector activities or remittances; it refers to gross or net income (i.e., before or after taxes); it has been adjusted to include the value of free social services; and it accounts for salary supplements in kind or in foreign currency. Elsewhere Ferriol refers to a Gini coefficient of 0.25 for 1989 (Ferriol 2001), suggesting a substantial rise in income inequality between 1989 and 1996–98. Starting from Brundenius’ estimate of a Gini coefficient of 0.22 for 1986, a European analyst has estimated it at 0.55 in 1995 (Fabienke 2001); meanwhile, a Cuban economist estimated it at 0.49 in 1999 (cited in Brundenius 2002). Despite the scarcity and weakness of information, and the increase in income inequality suggested by the mentioned Gini coefficient estimates, Ferriol asserts that “the Cuban population continued to have the lowest income inequality in Latin America and the Caribbean, which was pointed out by CEPAL in a report presented to its 28th meeting” (p. 83). Actually, the mentioned ECLAC report compared Gini coefficients for 13 Latin American and Caribbean countries, excluding Cuba; references to Cuba appeared only in three of the tables (out of 51 tables and 18 charts) included in the report (CEPAL 2000b: 37– 38). Ferriol does not provide specific recommendations regarding social policies, instead arguing that in order to sustain and improve social indicators, “it is essential to improve economic conditions, as economic growth is also necessary for social development. Even if the efficiency of [social] policies were to improve, available resources might still be insufficient to continue broad and integral programs.” This would require “making deeper changes in the economic model” and “continuing the economic reforms that began in 1993.” This would entail “eliminating monetary duality, decreasing the segmentation of goods and services markets, and restructuring the labor market” in order to make it more transparent, and the application of “a social policy with specific actions to address the needs of the population at risk of poverty” (pp. 83, 86–88). In Chapter 3, Pérez argues that although the educational system was adversely affected by the lack of financial and material resources (cut backs in school lunches, deterioration in the physical plant of educational institutions, shortages of instruction materials), its universality and free access was maintained. Moreover, she further argues that since 1994, secondary and higher education enrollment rates have recovered and there have been improvements in the quality of education and in the overall efficiency of the educational system (pp. 13, 94–98). Pérez suggests that the fall in elementary education enrollment between 1997 and 2002 was attributable to the decline in the population 6 to 11 years of age (p. 103). However, the enrollment rate for the cohort 6 to 11 years of age also fell from 100% in 1989–90 to 99% in 1994–95 and had not returned to the earlier rate by 2001–02 (p. 120). Pérez also states that secondary education enrollment was relatively unchanged during 1997–2002 and expanded significantly in 2002–03, in line with the increase in population 12 to 14 years of age (p. 103). According to UNESCO statistics, the secondary education enrollment rate declined from 90.2% in 1989 to 74.5% in 1994, and increased to 89% in 2002, close to the 1989 level (UNESCO 1999, 2004). According to Pérez, authorities “limited” higher education enrollment during the decade of the 1990s because of the lack of demand for graduates (p. 106). Higher education enrollment fell by 58% between 1989–90 and 1994–95 and recovered subsequently, but by 2002–03 it was still 20% below the pre-crisis level. Changes in enrollment vary significantly across disciplines: compared to the pre-crisis level, enrollment in 2002–03 was 57% lower in agricultural sciences, 38% lower in natural sciences and mathematics, and 32% lower in technical careers, while it was 565% higher in humanities and social sciences, and 343% in education (CCE 1991; ONE 1998, 2001, 2003).5 The enormous investment in humanities and education careers (Cuba already has the lowest student- to-teacher ration in the region6), at the expense of science and technical careers crucial for economic growth, represents a misallocation of scarce resources that will have long-term implications. Pérez recognizes this problem, stating that “technical careers, so important and so highly demanded by the productive sector, only represent 10% of enrollment” (p. 107). Contrary to this concern, in the final chapter Dhaynaut and Máttar assert that “the levels of enrollment in technical and higher education are determined by economic development needs” and that the educational system is “placing special emphasis on technical and scientific specialties, in order to promote innovation and its diffusion” (pp. 306–307). The shift in relative salaries across occupations discussed above is one of the principal reasons for the decline in secondary education enrollment. Simply put, there is no incentive to study a university-level career for 5 or 6 years that will lead upon graduation to a very low-salary job. Many professionals have left state sector employment and moved to better-paying jobs in foreign-invested enterprises or in the private sector (this explains in part why the government has been restricting the private sector). Pérez states that in 1999, teacher salaries were increased in order to promote retention; basic monthly salary for teachers currently ranges from 280 to 330 pesos, and could reach as high as 425 pesos considering special premiums, the latter figure 73% higher than the national average salary in 2001. Nevertheless, according to Pérez, “for some professionals these increases in salary are still insufficient to meet the high cost of living” (p. 111). At the current CADECA exchange rate, even a 425 peso-per-month salary is equivalent to $16 per month, is insufficient to be able to purchase food in TRDs for the three weeks per month not covered by the rationing system (Mesa-Lago and Pérez-López 2005). The well-documented fall in the higher education enrollment in the 1960s had a negative impact on Cuba’s international image. For this reason, and in order to reduce open unemployment (see below), Cuba has greatly expanded higher education enrollment. Thus, higher education enrollment in humanities and social sciences in 2002–03 was 530% higher than in 2000–01.7 Another miraculous jump in higher education enrollment occurred in the school year 2003–04: according to different sources, between 128,377 and 300,000 new students were enrolled in that academic year (see Mesa-Lago and Pérez López 2005). The Minister of Higher Education reported that the existing 17 universities were “multiplied” by the establishment of 732 higher education centers at the municipal level and the number of instructors rose by 83%; half of the new students are enrolled in long-distance courses on socio-cultural studies, social work, education, or continuing education courses for retirees (Vecino Alegret 2003). An obvious set of questions is how it has been possible to increase in a single year the number of higher education institutions 43–fold, the number of instructors by 83%, and enrollment by 56%; what type of training have the new 44,000 professors received; what is the quality of the new programs; and what productive employment will be available to the 300,000 persons who will eventually graduate from these programs. Pérez candidly sets out three potential problems associated with universal higher education: (1) “it will create social tensions, as demand for higher education graduates shows limited growth potential, and it could even exacerbate pressure to emigrate”; (2) “despite improvements, there are still problems that put in question the role of education as a strategic sector to promote economic development”; and (3) the new programs “present a challenge to the Cuban model, as their massive application requires efficiency and a substantial improvement in the quality of education at all levels … and their results cannot yet be evaluated on a national scale” (pp. 96, 116). Chapter 4, also authored by Ferriol, stands out as the best in the book in terms of balance, use of comparisons between 2002 and 1989, and discussion of key problems not yet properly addressed. Ferriol presents a somber situation regarding food consumption: (1) prior to the economic crisis, the rationing system largely met the basic food needs of the population, but currently the rationing system in the city of La Habana (deemed to be the model rationing system in the nation) only provides 51% of recommended calories, 43% of proteins, and 17% of fats; (2) the monthly subsidy per capita implied in rationing amounted only to 6 pesos per capita in 2002, about 2% of the average salary, but was given to the entire population without regard to income, an inefficient social policy in view of the rise in income inequality; (3) to meet the overall food needs residents must also purchase goods in parallel markets, agricultural markets, or hard-currency stores, where prices are generally set by supply and demand, are much higher than rationed prices, and therefore are out of the reach of those with low income; (4) these segmented markets for food products create the conditions for black marketeering and prevent prices from falling; (5) by 2002, per capita average production and consumption of vegetables, fruits, and tubers had surpassed 1989 levels, but those of meats, fish, eggs, and milk were still substantially below 1989 levels; moreover, quality of the latter products has deteriorated and the possibility of returning to pre-crisis production and consumption levels is beyond the capabilities of the current economic model; (6) “although consumption at constant prices of 1997 rose at an average annual rate of 3% in 1998–2002, it has not returned to 1989 levels”;8 (7) in 1998–2002 food availability improved but recommended nutritional levels were not reached (consumption of calories was 16% above the recommended level, but that of oils was 41% below and of proteins 2% below recommended levels);9 (8) the percentage of underweight infants at birth climbed to 9% during the 1990s and fell to 5.9% in 2002 (a historical low), but anemia affects 46% of children aged 6 months to two years; (9) Cuba is currently a net food importer, hard currency imports exceed exports, and the agricultural export sector shifted from generating a surplus to a deficit; and (10) production of meat, milk, rice, and beans is insufficient, requiring substantial imports that account for about half of total food imports (pp. 73, 139–145). Ferriol should have presented current data on the rationing quotas and the prices that consumers face when buying food and other products in the agricultural markets. For example, the monthly rationing allowance per capita in 2002 was 8 eggs, 6 pounds of rice, 1.25 pounds of beans, 0.5 pounds of lard or cooking oil, and 2.7 pounds of a combination of beef, chicken, or fish, amounts that covered about one week’s worth of normal consumption. The monthly average salary in hard currency was $16 at the CADECA exchange rates, which sufficed only to buy one bar of soap, one-half liter of cooking oil, and one pound of malanga in hard currency stores (Mesa- Lago and Pérez-López 2005). Ferriol attributes the failure to increase agricultural output and the ensuing food shortages to two factors: (1) the “limited recovery” of agricultural production, which in some areas “does not show definitive signs of recovery’: and (2) ”the chronic shortage of hard currency … which limits the ability to import,” a problem that she associates with the historical high dependence on food imports and the economic crisis of the 1990s (pp. 138, 141). However, she does not wonder why in the three decades before the crisis, at a time when Cuba received generous economic assistance from the Soviet Union and the CMEA countries ($65 billion from the former Soviet Union alone in subsidies and loans, of which Cuba payed only $500 million) the island was unable to boost and diversify agricultural production. Ferriol describes favorably policies in the last 15 years intended to increase agricultural production, but does not analyze their actual impact. For example, she lauds the conversion of state farms into basic units of cooperative production (Unidades Básicas de Producción Cooperativa, UBPCs), but fails to note that the government continues to direct their production plans, actually sold them their equipment and structures (the UBPCs have huge debts to the state for these acquisitions), are required to sell the bulk of their output to the state at lower prices than if they sold to consumers in free markets, and their sales in agricultural markets have fixed maximum prices (the prices cannot exceed a certain “top”). For these reasons, 40% of UBPCs recorded losses in 2003. Moreover, although they controlled 58% of total cultivated land, UBPCs only supplied 4% of the products sold by the free agricultural markets, while private farmers, with only 17% of cultivated land, supplied 73% of the products sold in these markets. In the last chapter, Dhaynaut and Máttar acknowledge “the lack of autonomy of cooperatives and restrictions regarding production decisions and authorization to sell production in … the agricultural markets,” suggesting vaguely the desirability of “granting additional space to supply and demand interactions in production and resource allocation decisions” (p. 315). They should have gone further, citing agricultural reforms in China, where the contract responsibility system distributed land to families, groups of workers, and villages, giving them full discretion to determine what to produce and whom to sell their output and at what prices; had Cuba followed the Chinese model in this regard, it would probably be self-sufficient in food production and could even be a net exporter. But Castro has rejected the Chinese model, deeming it inappropriate for Cuba (Mesa-Lago and Pérez-López 2005). Before the economic crisis, with very few exceptions, Cuba was at the top of public health indicators in Latin America, a position that it also held in 1958 (Mesa-Lago 2002). It is remarkable that, despite the sharp decline in GDP during the 1990s, Cuba maintained free and universal access to public health services. But several of Pérez’s assertions in Chapter 5 are debatable or are contradicted by official stastics. In addition, the focus on the period 1997–2002 conveys the impression of steady improvement; a longer perspective spanning the 1980s to the present would show significant deterioration during the crisis and a modest recovery that has not returned key indicators to their pre-crisis levels. Pérez affirms that “[public health] indicators, particularly morbidity indicators, were not significantly affected during the worst years of the crisis,” and reports that the principal illnesses whose reporting is compulsory either were eliminated or their incidence reduced between 1997 and 2002 (pp. 155, 166). But statistics for the period 1989–2002 show significant differences for specific illnesses: dyptheria, poliomielitis, measles, tetanus, and whopping cough were eliminated or their incidence declined, but the incidence for others rose significantly during the depth of the crisis and later declined. In 2002, the incidence rate was below the corresponding rate in 1989 for acute diarrhea, chicken pox, syphillis, and blenorrheagia, but above the 1989 rate for acute respiratory diseases, viral hepatitis, and tuberculosis (Mesa-Lago and Pérez-López 2005). Until the economic crisis, the Cuban public health system was characterized by being excessively costly, very capital intensive, and heavily dependent on imports from the socialist community (CEPAL 2000a: 274–275). The inability to continue to import medicines, medical equipment, spare parts, and other inputs from the Soviet Union, coupled with an overall financial crisis, prompted a focus on primary health care. Pérez notes that in the 1990s, the Ministry of Public Health significantly changed its objectives, “prioritizing health promotion and prevention of illnesses,” which has led to a reduction in communicable diseases. In addition, a national effort “is continuing to develop domestic vaccines that would meet future national needs” (pp. 155–156, 167). Meanwhile, the prevention of communicable diseases through immunization has declined markedly; in 2002 the immunized population was between 25% and 90% lower than in 1989 with respect to five basic vaccines, and also lower than at the worst moment of the crisis. Immunization against tuberculosis fell by 56% although the incidence of this serious illness climbed by 60% over 1989 (Mesa-Lago 2005).10 Cuba is eigth in the Latin American region with respect to mortality associated with communicable diseases (PAHO 2004). Cuba’s infant mortality rate fell steadily during the 1990s (from 11.1 per 1000 live births in 1989 to 6.5 in 2003) and currently it is the lowest in the region, but the mortality picture is different for other groups. Pérez notes that there was a decrease in “total” maternal mortality from 43.8 to 41.7 per 100,000 live births between 1999 and 2002 (p. 179). It is interesting that, with respect to this indicator, the author diverges from the rest of the book and does not compare levels in 1997 and 2002. Moreover, she does not mention that in 2001, Cuba changed the methodology underlying the series: while formerly “total” maternal mortality included direct and indirect mortality as well as mortality attributable to “other causes,” the new series eliminates the “other causes” and therefore results in lower mortality rates. Moreover, since the new series is only recomputed back to 1996, comparisons with 1989 are not possible. In 2000, the maternal mortality rate was 55.7 according to the old series, but 40.4 according to the new series, as the latter excluded 15.3 deaths per 100,000 live births attributable to “other causes.” The new series shows an increase from 38.6 in 1997 to 41.7 in 2002. Finally, the 2002 maternal mortality rate according to the new series, despite the exclusion of “other causes,” is higher than the “total” rate of 29.2 in 1989. Meanwhile mortality for the cohort 65 years of age and older rose from 48.4 per 1,000 in 1989 to 55.7 in 1993 and later declined to 49.7 in 2001, still above the corresponding levels before the crisis (Mesa-Lago 2005). Pérez refers to a program to ease the substantial shortages of medicines “since during the 1990s, production, distribution, and sale [of medicines] stagnated” because of cuts in imports of raw materials (p. 157). In reality, production did not just stagnate, but it actually declined, and hard currency imports of medicines (not just raw materials to manufacture medicines) fell by 50% in 1993, and by 1996 they were still below the 1989 level. According to Pérez, the family doctor program (about half of all physicians in the country are family doctors) mitigate the adverse effects of the crisis, but she fails to point out that family doctors are limited in what they can do since they often lack the most basic medicines. To be sure, it is possible to purchase medicines in hard currency stores, but only those individuals who have access to hard currency are able to obtain them. Pérez asserts that “despite the sharp contraction of the Cuban economy during the mid-1990s, …. real public health expenditures continued to rise,” with an increase of 40 percentage points in per capita expenditures (at constant prices of 1997) between 1997 and 2002 (pp. 172–173). However, at constant prices of 1981, real expenditures per capita fell from 66.90 pesos in 1989 to 16.40 pesos in 1993, rising later to 53.00 pesos in 1999, still 21% below the 1989 level (Sixto 2003). Cuba ranked 14th within the Latin American region in public health expenditures per capita in 2002 ($229, based on purchasing power parity exchange rates), with only six countries—the least developed ones in the region—having lower expenditures than Cuba. Cuba was 6th in the region (in a virtual tie with two other countries) in total expenditures on public health as a percent of GDP; however, Cuba’s total public health expenditures as a percent of GDP of 7.2% is broken up into 6.2% in public expenditures and 1% in private expenditures, a puzzling set of figures since the practice of private medicine is, for all practical purposes, banned. If only public expenditures were considered, Cuba would rank 10th in the region (based on UNDP 2004). Public health policies have focused on “making more efficient use of available resources,” states Pérez (p. 156), but she omits analysis of two key indicators that measure the efficiency of hospitals. Thus, the number of “real” hospital beds per 1,000 inhabitants fell from 5 to 4.5 between 1989 and 2001; despite this, the hospital bed occupancy rate contracted from 73.9% to 69.8% in the same period; to 56% in pediatric hospitals, and to 47.5% in hospitals specializing in care of newborns.11 Hospital stay rose from 9.9 days in 1989 to 10.4 in 1993, and fell to 9.4 in 2001 (ONE 1998, 2003; MINSAP 1995 to 2003). If the average hospital stay had been reduced to 7 days (still high by international standards), the index of hospital bed occupancy rate would have fallen to 56.2% (Mesa-Lago 2003b). Pérez does not address the well-known deterioration in the quality of public health services, described as follows in a recent editorial in a Cuban journal: “The current deterioration in the public health system is not, in our opinion, only the result of the embargo or blockade” but also of other reasons: (1) the physical and structural deterioration of public health facilities—run down, dirty, “cannibalized”—as a result of normal wear and tear combined with “generalized larceny” and the “indifference” of managers at all levels; (2) the poor organization of patient care, including visits, referrals, and hospital admissions; (3) the priority that public health centers give to the fulfillment of norms not related to the well-being of patients, that limit access to services and “delay medical attention by imposing requirements not directly related to medical considerations”; (4) the uneven access to certain scarce diagnostic tests, technologies, and equipment, that often require “extra-institutional efforts,” such as “sociolismo” (contacts, friendship) and illegal payments (corruption); and (5) the poor personal treatment of patients by physicians and other public health personnel (“La salud pública” 2004). Pérez also neglects to mention that Cuba has a separate public health system for members of the armed forces, internal security forces, and high-level Communist Party and government officials that has superior facilities and provides overall better quality health services than the system available to the general public; Cuba also offers “health tourism” services for hard currency that are of superior quality than those available to the average citizen (Mesa-Lago 2003b). Pérez does not make recommendations regarding public health, but reports goals for 2015, among them to reduce by two-thirds the mortality rate of children under 5 years of age, already the lowest in the region in 2002. The more this indicator falls, together with the overall infant mortality rate, the harder to induce further declines, requiring ever larger investment of resources (recall that the occupancy rate of rooms in children’s hospitals is only 47.5%). In order to continue to lower infant mortality in the first year of life (already the lowest in the Americas, after Canada’s, and at par with the United States) Cuba uses expensive technologies to detect congenital defects in fetuses and provides special attention and diet to expectant mothers. While undoubtedly these are positive interventions, they require scarce resources to address a problem that has been largely resolved, at the expense of other more severe and urgent problems, such as the water and sewage infrastructure, food consumption, and housing. Similarly, the scholarships granted to foreigners to study medicine and other university careers in the island, as well as the assignment of thousands of health professionals (including family doctors) to overseas posts as part of a foreign aid program, are worthy actions but very expensive. The existence of a separate and higherquality health care system for members of the armed forces, internal security personnel, and high-echelon government and party leaders is not only expensive but also a source of inequality and an irritant for the general population subject to real restrictions on health care services. Pérez should have addressed these issues and made recommendations to address them. Atienza notes in Chapter 9 that the sharp reduction of imports of equipment, parts, and chemical products from the socialist countries, coupled with interruptions in the electrical system that affected the operation of pumps and water distribution and sewage systems, reduced overall potability of water and the quality of water treatment, contributing to an increase in communicable diseases (for example, acute diarrhea, hepatitis). She also asserts that by 2002, the volume and quality of water and sewage services had surpassed the 1990 level as a result of the construction of aqueducts, water purification plants, and sewage pumping stations, but presents statistics only for the period 1999–2002, making it impossible to confirm the alleged progress between 1989 and 2002. Based on the statistics she presents, it is clear that no new water purification plants were built between 1999 and 2002 and only one water fluoridation plant was operational over the period (pp. 276–278). Moreover, official statistics indicate that the volume of water flowing through the urban public sewage system fell from 672 hm3 in 1998 (ONE 2001) to 569 hm3 en 2002 (p. 278), a reduction of 15%. Atienza points out that the quality of drinking water has been hampered by several causes, but does not indicate the relative importance of each: (1) drinking water is available on average 12 hours per day, forcing “part” of the population to store water in tanks and other containers, which “may affect” the potability of the water (the population of La Habana must boil city water in order to eliminate bacteria and parasites); (2) the distribution system does not reach all areas of the city and “part” of the existing system is in poor condition; (3) “part” of the pumping equipment is also in poor condition; and (4) water supply is “unstable” because of interruptions in electric power (p. 281). The latter problem worsened in mid- 2004 when the largest power generation plant (the Antonio Guiteras thermoelectric plant) was shut down for major repairs and other plants also suffered breakdowns, adversely affecting the pumping system and requiring the institution of water rationing (Granma, September 29 and 30, 2004). Chapter 6, also authored by Pérez, describes Cuba’s recent policies to promote full employment and their positive impact on reducing open unemployment and generating economic growth, although she ignores their adverse impact on worker productivity. Pérez also discusses positively the purported freedom to form labor unions in the island. The exceedingly low official open unemployment rates reported for 2002–04 cover up persistent “high levels of underemployment” (p. 317), and probably count as employed many who, strictly speaking, are not, or are employed in very low productivity jobs. They are consistent, however, with Castro’s 2002 dictum that Cuba would eliminate unemployment. Castro said (2002): “Unemployment has to disappear. … In Cuba there will be no unemployment. … We have promised our young people that they are guaranteed jobs on one condition: that they be prepared.” Thus, in 2001–03, the government created five new “study as employment” programs to absorb the jobless and in addition payed 60% of their salaries to workers who lost their jobs because of temporary closures of their workplaces and to redundant workers who had not been placed in new employment (pp. 193–198, 214). In 2002, there were 764,668 persons involved in these programs, representing 16% of the EAP of 4.7 million persons, although Pérez does not indicate how many of them are considered as being employed. Contrary to Pérez’s assessment of rising labor productivity, official statistics she cites indicate that labor productivity growth was negative or stagnated during three years in 1998–2002, and with the implementation of “full employment” and “study as employment” programs, productivity growth was 0.1% in 2001 and -0.1% in 2002 (pp. 190–192, 216). Labor productivity fell by 32% in 1989–93 and by 1997 it was still 20 percentage points below the 1989 level (CEPAL 2000a: 235). One of us has estimated, based on the annual rates reported by Pérez for 1998–2002, that the average level of productivity in 2002 was still 12.6 percentage points lower than in 1989 (Mesa-Lago 2005). The economic crisis and the full employment policies resulted in drastic changes in the composition of the EAP by sector of economic activity between 1991 and 2002 (in percentage points): contraction in manufacturing (4.1), construction (3.6), transportation and communications (1.3), and mining (0.4), and increase in community, social, and personal services (7.8), agriculture (1.2), and commerce, restaurantes, and hotels (0.7) (calculations based on CEPAL 2000a: A-46 and 2004b: 199). In 1997–2002, community, social, and personal services was the sector that created the largest number of jobs (increase of 68%), but it was precisely this sector that suffered the largest decline in average productivy (-3.7%) during the same period (p. 215). Pérez does not consider the productivity decline as a problem, noting that “the government is pursuing an employment and salary policy that has two different rationales: economic and social. For humanitarian reasons, it gives priority to the latter,” although she admits that the difficult economic situation “requires solving those problems that adversely affect economic performance” (p. 209). A box in Pérez’s chapter asserts that Cuba holds “high prestige” within the International Labor Organization (ILO) and it has ratified 87 international conventions, including the convention on freedom to form unions, which places it second within Latin America in terms of the number of conventions ratified (p. 209). This assertion is refuted by Provisional Report No. 332 of the ILO’s Committee on Freedom of Association, issued in 2004 in response to complaints against the Government of Cuba submitted by two international and one regional confederations of trade unions alleging violations of ratified Conventions 87 and 98. After taking into consideration the response from the Government of Cuba, the mentioned Committee forwarded to the Governing Body of the ILO the following observations and recommendations: (1) “The Committee deeply regrets that the Government of Cuba categorically rejects the possibility of a direct contacts mission” and “the lack of will to cooperate fully in the proceedings”; (2) “urges the Government promptly to adopt new provisions and measures to recognize in legislation and in practice the right of workers to establish the organizations they deem appropriate … in particular, organizations independent from the current trade union structure”; (3) “urges the Government to take measures to amend legislation with regard to collective bargaining” to ensure that collective bargaining “can take place without recourse to binding compulsory arbitration prescribed by the legislation and without interference by the authorities, organizations at higher level, or the CTC (Central de Trabajadores de Cuba)”; (4) “strongly expects that the Government will ensure that the right to strike can be exercised in an effective manner in practice and that nobody will be discriminated against or prejudiced in their employment for peacfully exercusing this right”; (5) “urges the Government to take steps to release immediately” the trade unionists condemned to between 15 and 26 years of prison “in summary hearings of very short duration”; and (6) “deplores the infiltration of security agents in the … trade union organization” and “urges the Government in future to comply with the principle of nonintervention or interference of the public authorities in the trade union activities” (ILO 2004b: 97–119). With regard to addressing employment issues, Pérez only recommends “completing quickly and fully the implementation of perfeccionamiento empresarial” (p. 209); introduced in 1999, it was only being applied in 15% of enterprises in April 2003 (Granma, April 20, 2003). According to Cuban economists, perfeccionamiento rests on vertical decision making and leads to concentration of power. The redundant workers resulting from its implementation will be difficult to place in productive jobs (see Mesa-Lago and Pérez-López 2005 for sources). In contrast, Dhaynaut and Máttar recommend in Chapter 11 the flexibilization of self-employment rules and and expansion of such activities—for example, by allowing groups of small service enterprises to join together— in order to reduce informality, unemployment, and tax evasion while promoting competition and innovation and diversifying the range of production of goods and services (pp. 54, 318). Similar recommendations were made in 1994 by Carlos Solchaga, former Minister of the Economy in Spain’s socialist government. In 1995 a draft law that would authorize Cuban citizens to own and operate small businesses circulated among policymakers, however, the draft law was shelved and, after 1996, the Cuban government began to impose restrictive measures— such as higher taxes, harassing inspections, fines— that resulted in the closing of many small businesses. The success rate of obtaining a self-employment license fell from 82% in 1996 to 24% in 2001 (Ritter 2004). In 2004, the government banned government officials, managers, and members of the military from engaging in self-employment and cancelled permits and suspended new ones for 40 self-employment occupations such as clowns, magicians, masseuses, used book sellers, and small restaurant operators (“Resolución No. 11” 2004). As a result, the number of self-employed workers fell from 208,500 at the end of 1995 to 149,990 in 2003, and was probably even lower in 2004. In contrast, Pérez asserts that the government “created a larger space for self-employment activities” that “was deepened through the expansion of the range of activities authorized for self-employment and the decision to issue licenses to engage in such activities” (p. 190). Dhaynaut and Máttar acknowledge that “underemployment levels were high” at the same time that Cuba officially reported very low unemployment rates (p. 317), but they do not connect the adverse effect of the government’s full employment policies on productivity. They also note that “the labor force of foreign-invested enterprises can only be hired or fired by a state employment entity” (p. 317), but they are silent on the fact that foreign-invested enterprises pay salaries in dollars to the Cuban government, while the government in turn pays Cuban workers in pesos (at the official exchange rate of 1 dollar=1 peso rather than the market rate of 1 dollar= 26 pesos) complemented with a small allowance in convertible pesos; similarly, they do not mention that the Cuban government ignored a request made by the European Union in 2002 to allow foreign-invested enterprises involving EU member countries to hire, promote, and pay workers directly in order to strengthen incentives. Chapter 7, authored by Ramos, asserts that social security pension coverage extends to “100% of the salaried labor force” (p. 219). This assertion overstates coverage because self-employed workers, unpaid family members, and the majority of private farmers are not mandatorily covered; they may join the system on a voluntary basis paying the equivalent of the employer’s contribution (while salaried workers usually pay nothing), a significant obstacle for their incorporation. In this section we analyze the high and rising cost of social security pensions and contrast it with the insufficient social assistance pensions. Ramos correctly points out that normal retirement ages in Cuba are among the lowest in the region: 60 years of age for men and 55 for women with 25 years of work. Since the average life expectancy at the time of retirement in Cuba is the longest in the region (20 years for men and 26 years for women), the system is very costly and such costs will rise in the long term for several reasons: (1) Cuba has the second oldest population in the region (after Uruguay) and will have the oldest population before 2025; (2) beginning in 2010, more persons will retire than will enter the labor force; and (3) in 2020–30, the “baby boom” cohort of the 1960s will reach retirement age (CEPAL 2000a; Mesa-Lago 2003b; Annex II-2). Expenditures on social security pensions (i.e., excluding social assistance pensions) rose from 5.3% of GDP in 1989 to 6.5% in 2003 (CEE 1991; ONE 2003); such expenditures are financed by a 12% payroll tax payable by employers which goes directly into the state budget. Implementation of a worker contribution, stipulated by the 1994 tax law, was suspended until 1997 when a 5% contribution began to be collected only from workers in enterprises covered by the perfeccionamiento management system (limited to about 2% of workers in 2002); self-employed workers and others who have joined the social security system voluntarily contribute 12% of their income. Ramos notes that employer contributions are insufficient to finance the system and its growing deficits are covered by the State (p. 231). The state’s subsidy rose from 1.3% of GDP in 1986 to 2.3% in 2003, and it is anticipated to continue to grow as the population ages. The ratio of active workers to pensioners, which was 3.6 in 1989, fell to 2.8 in 2002 and is projected to fall to 1.5 by 2025. To break even, in 2002 contributions would have had to be set at 17.9% of payroll; to reach long-term balance, however, contributions would have had to rise to 39% to 86%, under different scenarios (Mesa-Lago and Pérez López 2005). In addition to the general social security system, Cuba has two special systems for members of the armed forces and of the Ministry of Interior. These schemes have qualification requirements and benefit levels that are more generous than those of the general system (pp. 84, 222). In 1995, the cost of the social security system of the armed forces, totally financed by the State, was equivalent to the deficit of the overall pension system; bringing financial balance to this system would have required contributions equivalent to 118% of salaries (Mesa-Lago and Pérez-López 2005). Ramos notes that the government’s social security policies “have given priority to social over economic objectives,” but the growing cost “will require additional financial resources, and the economic sustainability of the system could be affected” (pp. 231, 238). Social security benefits historically have been low, but before the crisis they were suplemented by subsidized or free consumer goods, transportation, electricity, water, housing, and public health services. Ramos reports that the average real pension rose from 1992 to 2001, but declined in 2002 (p. 228); however, he does not show the comparison in 2002 and 1989. The average real pension declined by 42% between 1989 and 1998, at the same time that there was a significant deterioration in the supplementary social safety net (Mesa-Lago 2003b). In 2002, the average monthly pension was 108 pesos, and the minimum monthly pension was 60 pesos (pp. 220, 228), equivalent to $4.15 and $2.31, respectively. According to Ramos, the number of social assistance recipients remained nearly constant in 1996–2000, but rose by 42% beween 2000 and 2002 at the same time that there was an increase in the social assistance benefit (pp. 231–232). In 2002, out of a total of 1.6 million pensioners, 20% (192,511) received social assistance benefits (p. 225–226), 1.7% of the island’s population. Since at least 20% of the population were at risk of poverty or deemed to be poor, it is clear that the bulk of the needy do not receive social assistance benefits. As a share of GDP, social assistance expenditures were rougly unchanged at about 0.5–0.6% of GDP in 1989–2000, but climbed to 1.2% in 2002 (Mesa-Lago 2003b; ONE 2003). However, the monthly social assistance pension in real terms fell by 60% in 1997–2002 (based on Annex II-47 and II-49). The average monthly social assistance pension in 2002 was 63 pesos, or $2.42. Some of Ramos’ recommendations on this topic are sound, although they are not very detailed, while others are not because she omits important considerations. The main recommendations are listed below together with our comments: (1) encourage increases in employment in order to improve the finances of the social security system (a significant portion of the new jobs being created have low productivity or the workers do not contribute to the social security system); (2) raise gradually the retirement age (she does not provide any concrete proposals, although this issue has been studied by several Cuban experts); (3) raise the purchasing power of pension benefits (she does not explain how this would be accomplished); (4) encourage older workers to remain longer in the labor force (she states that 24% of self-employed workers are older persons, although this share has been declining in recent years), and (5) conduct actuarial projections of the system (she mentions that such an exercise was begun in Cuba in 2003, but ignores the fact that the ILO has conducted two sets of actuarial projections) (pp. 239–241). Ramos mentions that the Ministry of Labor and Social Security is developing a new Social Security Law that would aim to make the system financially viable (p. 312), but does not discuss the details of such a proposal although a draft was circulated in 2003 with its major elements. The proposal would not raise the retirement age but would provide incentives to encourage voluntary deferrals of retirement (Sandó 2003), obviously insufficient to tackle social security’s current and future financial problems. Ramos should have discussed incentives to incorporate selfemployed workers into the social security system and to increase the proportion of workers that contribute to it, the creation of a retirement option for young workers that might have an investment component resulting in higher benefits, and how to incorporate the two privileged, very generous ans expensive retirement systems for the armed forces and internal security officers into the general social security system. With respect to social assistance, Ferriol stresses in Chapter 4 that the entire population benefits from price subsidies through the rationing system, without regard to income (p. 148), an inefficient way to distribute scarce resources at a time of rising income inequality. Ferriol ignores a proposal by several Cuban experts that would eliminate price subsidies and free social services to the population at large that are not means-tested, focusing assistance on those that are in need (see sources in Mesa-Lago and Pérez López 2005). Chapter 8, authored by Atienza, describes Cuba’s housing sector policies and their results. In this section, after explaining the lack of a continuous statistical series on housing construction in socialist Cuba, we present housing construction trends and discuss the housing deficit. Atienza describes the numerous changes in housing policies in socialist Cuba, including nationalization of the housing stock, costly design of public housing followed by rapid construction of low-quality homes, and the Soviet-donated plant for pre-fabricated dwelling buildings. At the beginning of the 1980s, restrictions on housing construction by individuals were lowered, swaps (permutas) were authorized, and access to construction materials improved. Atienza argues that these changes occurred because the leadership had become aware of the flaws in the then-existing housing construction model which was highly centralized, relied on imported inputs, and required large amounts of energy and material inputs. Despite this, in 1987–89, on the eve of the collapse of the Soviet bloc, Cuba made a very large investment in imported machinery and equipment for housing construction. Moreover, the 1988 Housing Law restricted private housing construction and swaps, discontinued sales of construction materials to individuals, strengthened the role of the state in housing construction, and increased penalties for violations of housing regulations. The economic crisis caused a sharp decline in the production of construction materials: between 1990 and 2001, cement production fell by 59%, cement blocks by 64%, sand and stone by 71%, and bricks by 73%. In 1992, after 34 years of ineffective policies, the government put in place a more common sense strategy for the housing sector that emphasizes maintenance, repair, and refurbishing of existing stock, completion of partly-built construction projects, application of low-input technologies, and wider use of local raw materials (pp. 246– 248, 254). Atienza ignores the lack of a homogeneous housing construction series for socialist Cuba, a serious impediment to analysis. Statistics on annual housing construction were not published in 1959–63; for 1964–80, statistics are available on construction by the state civil sector; for 1981–87, statistics include state construction plus housing construction by cooperatives, the armed forces, and the population (the latter distinguishing between dwellings with statecertified “habitability” and those that lacked such certification); since 1988, statistics exclude construction by the population without certification and by the armed forces. In 1981–87, a period when state rules became more flexible and the availability of construction materials improved, the largest number of housing units was built, with an average of 60% of them built by the population. But the restrictive 1988 housing law and the economic crisis sharply reduced housing construction by the population, bringing it down to 34% of total housing units built in 1990–2002. During the three five-year plans spanning the period 1976–90, housing construction targets were unfulfilled by 45% (Mesa-Lago 2002). Soberly, Atienza argues that the new policies that prioritize maintenance, repair, and refurbishing of housing units “prevented the collapse of the [housing] sector at the start of the 1990s” (p. 249), while more boldly, García asserts that since 1994, “the number of housing units built recovered significantly” (p. 113). The problems noted above do not allow exact calculations, but roughly the average number of housing units built annually fell from 62,015 units in 1981–89 (6.1 per 1000 population) to 28,638 in 1990–94 (2.8 per 1000 population), and then rose to 41,604 in 1995–2003 (4.5 per 1000 population), still 30% below the pre-crisis level. Moreover, housing construction fell to 25,000 in 2003 (2.2 per 1000 population), lower than the average during the depth of the crisis (Mesa-Lago and Pérez-López 2005). The nation’s housing stock rose from 1.90 million units in 1970 to 3.13 million units in 2002 (p. 258); based on these data, we have estimated the ration of population per housing unit declining from 4.53 to 3.57. She points out that the increase in housing units is not attributable only to new construction, but also reflects “division of existing housing units, additions, and construction on flat roofs.” According to the 1981 population census (the results of the 2002 census had not been released as of July 2005), “insufficient conservation and refurbishing of the housing stock had led to its progressive deterioration,” so that “at present, about 40% of housing units are in mediocre (regular) or poor condition (mal estado).”13 In 2000–01, three hurricanes destroyed 35,724 housing units and damaged an additional 272,105 units, requiring the focussing of available resources on their reconstruction, to the detriment of maintenance and refurbishing (pp. 258–260). The Economic Development Strategy for 1980–2000 estimated that an average 60,000 housing units per annum would have to be built just to replace the deteriorating housing stock (García Díaz 2004b); since the average annual number of units actually built was about 48,000, it stands to reason that the housing deficit must have risen substantially. Atienza points out that one of the challenges is to conduct “detailed studies that would yield better estimates of the housing deficit” (p. 263). Despite this, and without citing any statistics or estimating methodologies, she posits that the “real housing deficit,” taking into consideration deterioration and demolition is 530,000 units (p. 258). Assuming three persons per household, such a housing deficit would affect some 1.6 million inhabitants, 14% of the population. However, a conservative estimate of the housing deficit made by one of us suggested that the housing deficit was some 880,000 housing units in 1985, and it would be considerably higher now considering that the rate of housing construction slowed down since then (Mesa-Lago 2002). Atienza notes that in the 2002 survey of poverty in the city of La Habana, the deterioration of their homes was cited by 16% of the respondents as the most serious problem after insufficient income and food consumption (p. 262), but she fails to note that 22% of the respondents to that survey deemed themselves as “poor” and 19% as “nearly poor” with respect to housing (Ferriol 2003). Atienza notes that in the 1990s, the housing sector “has been experiencing its most difficult situation” since the start of the revolution, facing severe challenges, among them the need to: (1) improve the quality of construction; (2) promote conservation and repair; (3) develop an efficient construction materials industry; (4) decentralize construction; and (5) broaden population participation in building houses (p. 263). These challenges are essentially the ones that the housing sector strategy acknowledged in 1992 and Atienza does not provide specific policies to cope with them. She should have stressed the imperative to return to the more flexible regulatory framework in place before 1988 that spurred population housing construction, supplemented with controls to avoid corruption. 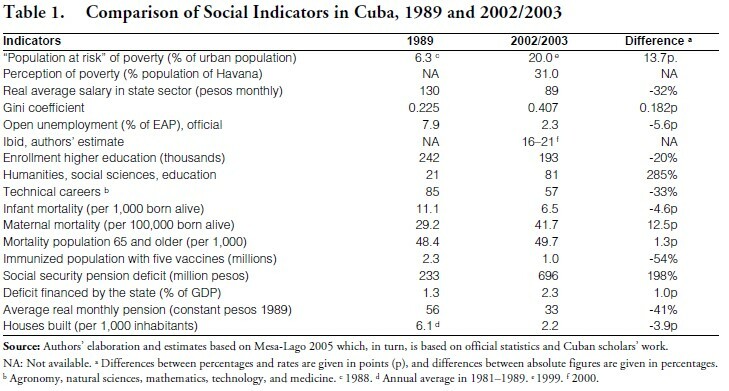 Table 1 compares, in summarized fashion, a set of social indicators for Cuba in 1989 and 2002–2003. Only infant mortality improved (decreased 4.6 percentage points); the open unemployment rate declined 5.6 percentage points according to official figures, but our estimate in 2003 is seven to nine times the official rate. The remaining indicators in 2002– 2003 were worse than in 1989: population at risk (of poverty) increased 13.7 percentage points; the real average salary diminished 32%; the Gini coefficient augmented 0.182 points; enrollment in higher education fell 20% (jumped 285% in humanities, social sciences, and education, while it decreased 33% in technical careers); maternal mortality rose 12.5 points; mortality among age 65 and older increased 1.3 points; the immunized population with five vaccines declined 54%; the social security pension deficit jumped 198% (the deficit financed by the state grew by 1 percentage point of GDP); the average real pension dropped 41%, and the number of houses built per 1,000 inhabitants declined 3.9 points. The book’s final chapter, titled “Social Policy Challenges at the Beginning of the 21st Century,” authored by Dhaynaut and Máttar, is the second shortest and the most timid. The first ten pages consist of a list of Cuban achievements in the last few years that omits the problems discussed in the individual chapters as well as those raised by us in this article. The authors assert that “no groups are excluded from basic services because of [lack of] income … or from participation in the labor force” (p. 309), but selfemployed workers, the majority of private agricultural workers, and family workers are not mandatorily covered by the social security system and have access to it only through voluntary affiliation and by contributing 12% of their wages, a significant disincentive to their enrollment. There are also considerable differences in pensions and health care services (members of the armed forces, the security services, and high-level officials receive better benefits) as well in access to food and medicines (they are readily available to those with very high incomes or hard currency through agricultural markets and hard currency stores). The authors assert that “public expenditure is the principal means of income distribution” after the 1994 fiscal reform (p. 311), but fail to note that the taxation system is regressive because of the heavy weight of indirect taxes. They also state that “in order to guarantee the universality of social policies,” there is a “system of public benefits, based on the principle that the state is best able to improve the quality of life of the population … [and] Cuba has not established a system of competition among social services providers” (pp. 308, 314). But they fail to analyze the impact of the state monopoly in providing social services on the quality of such services, and to explore the potential benefits from private sector providers (including self-employed professionals). Furthermore, the banning of non-state providers in social services contradicts the government allowance of different providers of goods and services (state, cooperatives, private), even though, as argued by the authors, they generate market segmentation and inequality. Finally, the authors assert that in the last decade, social services have been modified “to promote the more efficient use of financial, human, and material resources” (p. 313), but they do not address the problems discussed above, among them: low efficiency in the use of existing hospital facilities, inefficient allocation of resources in the areas of health and education, and proliferation of non-productive employment. Dhaynaut and Máttar note that “to reach stable and sustainable development, it is not sufficient to have good macroeconomic policies, which must be supplemented by active policies to strengthen the productive structure,” which could be accomplished by continuing to rely on “central planning with regard to strategic interests” while “deepening the diversification of property relations [public, cooperative, private], management decentralization, and a more prominent role for the market” (p. 316). The Cuban government reacted to their recommendations by implementing recentralizing measures in 2003– 2004. In the last section of their chapter, Dhaynaut and Máttar offer some general policy recommendations, but do not discuss them in detail, and in some instances confuse their own policy recommendations with policies currently being pursued by the Cuban government. They identify some persistent social problems, but do not provide policy recommendations to address them. Examples of these lingering problems are: “overall food availability has improved, but it is still insufficient … the quality of rationed goods has deteriorated and there is still lack of balance in the composition of the daily diet”; although “water potability has improved, water supply shortages continue”; “it is essential to stop the deterioration of the housing stock”; and “the aging of the population places significant pressure on the social security system and … raises questions about its financial sustainability” (p. 315). In our judgement, the book lacks an integrated and coherent social policy strategy for Cuba today and in the future. The chapters describe social policies implemented in the 1990s and at the onset of the 21st century and analyze their effects, but their recommendations are timid and take the form of very brief “conclusions,” “reflections,” “challenges,” “dilemmas,” or “objectives.” No policy recommendations are offered in the areas of education, food consumption, housing, and water and sewage, while in other areas, suggestions can only be read between the lines. Moreover, the book offers a few sound policy suggestions, but errs in conveying the overall impression that the inmense majority of policies implemented by the Cuban government have been successful in addressing the island’s social problems. Along this line, while the authors raise some weaknesses with the current development model and recommend a few modest corrections, they do not present policy recommendations that would address the island’s extant and future social challenges. Let us hope that future ECLAC studies on Cuba will be bolder and articulate a sound long-term social strategy for the island. 1. We are grateful to Claes Brundenius, Sergio Díaz-Briquets, Manuel García Díaz, María Dolores Espino, Joseph Ramos, and Archibald Ritter for very helpful comments. An abbreviated version of parts of this article was published as Mesa-Lago, “Problemas sociales y económicos en Cuba durante la crisis y la recuperación,” Revista de la CEPAL, No. 86 (LC/G.2282–P), Santiago, Chile, CEPAL, August 2005: 183–205. The current version adds two sections and expands in several other areas. 2. In what follows we do not discuss in detail Chapter 1, dealing with economic reforms, macroeconomic policies, and recent economic performance, and Chapter 10, a case study of the historic core of the City of La Habana, for space reasons and because we concentrate on the chapters that analyze social policies at the national level. 3. In contrast, an earlier ECLAC publication on Cuba (ECLAC 1997, 2000) involved contributions from about 20 experts from ECLAC and other international organizations with some collaboration from Cuban institutions, and was coordinated by a single ECLAC expert. 4. While Ferriol asserts that prices in agricultural markets declined over 1994–97 and stabilized thereafter (p. 150), data in the Statistical Annex shows that they rose by an average of 22% in 2002 (I-6); prices in agricultural markets also rose in 2003 and 2004. With respect to TRD, prices rose between 10% and 30% in 2004 (“Resolución No. 54” 2004) and by an additional 10% in November 2004 as a result of the 10% discount on the value of the dollar. 5. The Anuario Estadístico for 2002 revised the higher education enrollment series for 1996–97 to 2000–01, raising enrollment in humanities and social sciences up to three times, and also raising the overall higher education enrollment figures (ONE 2001, 2003). Cuban authorities have not explained the rationale for these changes and Pérez does not make reference to them (see Mesa-Lago and Pérez- López 2005). 6. According to official data provided by Castiñeira (2004), the student-to-teacher ratio in 2002 was 9.4 for elementary education and 11.6 for secondary education. 7. As noted earlier, this increase in higher education enrollment may be attributable in part to statistical manipulation. 8. Ferriol should have provided the underlying data on consumption levels, but is likely that she was unable to do so because the series based on 1997 prices has not been recalculated back to 1989, or at least such a recalculated series has not been published. At constant prices of 1981, personal consumption fell 40% between 1989 and 1993, and despite some improvement, in 2000 it was still 22% below the 1989 level (Togores and García 2003). 9. According to other sources, in 2001 consumption of calories in Cuba was 7% below the regional average. In 2002 it was 10% below 1985 levels for proteins and 6% for calories. In 1998–2000, 13% of the population was undernourished, ranking Cuba 9th in the region with regard to this indicator (OPS 2004; Sixto 2004; UNDP 2004). 10. BCG, bacille Calmette-Guerin, is the vaccine used most widely against tuberculosis. Annual varations in immunization could be the result of changes in the number of births and the ages at which the vaccines are administered. This is an issue that requires further clarification. 11. This is the result of the slow population growth rate and of the ageing of the population. However, unnecessary hospitals should be shut down in order to conserve resources and build senior citizen facilities. 12. The ILO (2004a), the highest authority in the labor area, excludes Cuba (as well as Haiti and Guatemala) from its tables about the Latin American region in its statistical publications. 13. In the city of La Habana, 43% of housing units were in mediocre or poor condition in 1999; in the older neighboords of La Habana, the corresponding rate was 75%. Fifty-nine percent of the housing units in the city as a whole had structural problems (Pérez Villanueva 2001). In the eastern provinces, more than 50% of housing units were in acceptable and poor condition (p. 260).